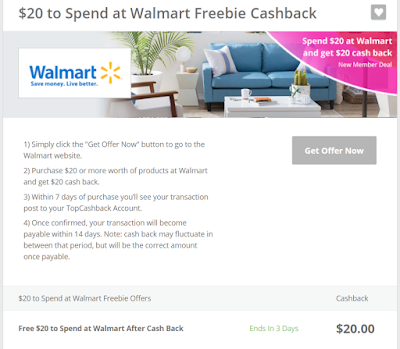 Savvy Spending: *HOT* New Top Cash Back members get FREE $20 to spend at Walmart!! Hurry, only 3 days! *HOT* New Top Cash Back members get FREE $20 to spend at Walmart!! Hurry, only 3 days! Top Cash Back members can get $20 cash back on ANY $20 purchase at Walmart! This is for new Top Cash Back members only.. but you can sign up other adult members in your household if you're already a member! 2. Then go here for this special Walmart offer. 3. Make a purchase valued at $20 or higher. Choose free in-store pickup to avoid shipping costs. 4. Within 14 days, your Top Cash Back account will be credited with $20 — enough to cover your purchase! 5. After you receive the $20 payment in your Top Cash Back account, you can choose to transfer it to your bank account or request a Paypal payment. This deal is valid through July 30, 2018!